When is the last time you heard the question, “Do we really need a corporate code of conduct?” asked in your company, if ever? And do you react with surprise or even a bit of annoyance as you read it here,thinking it’s stupid to even ask such a thing in 2014? Whether your company has established a code of conduct because it faced a legal requirement to have one, or to satisfy stakeholder demands,or to serve as the foundation of the organization’s compliance program, the very idea of questioning the value of having a corporate code of conduct seems outmoded in today’s business world. And yet, if we slightly rephrase the question to ask, “What value can we gain from a code of conduct?” we set the stage for a meaningful management discussion about building value from a next generation code of conduct. 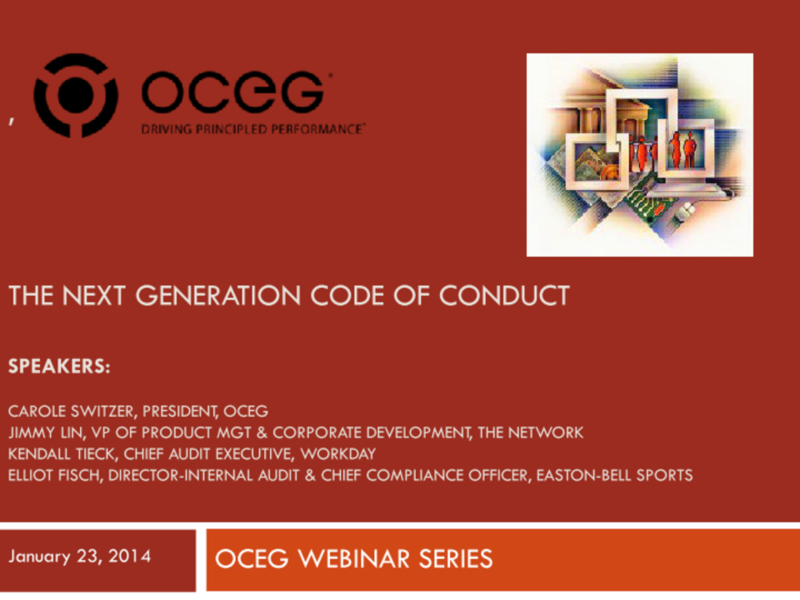 In this webinar, our expert panel will discuss the advantages that can be gained by taking a “next generation” approach to delivering Codes of Conduct. We have emailed instructions to access The Next Generation Code of Conduct Slide Deck to . Make sure the email arrives in your inbox: either add "support@oceg.org" as a safe sender to your email platform, or if you use Gmail, drag our email into your Primary tab.